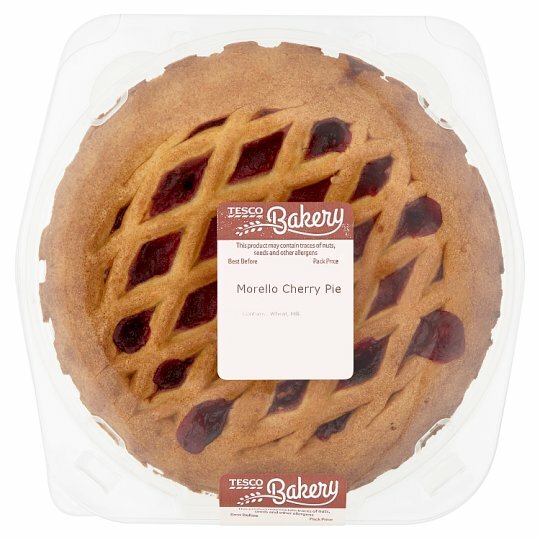 Lattice topped shortcrust pastry with Morello cherry filling. Lattice topped shortcrust pastry filled with sour Morello cherries for a sweet, tangy pie. Cherry (29%), Wheat Flour (Wheat Flour, Calcium Carbonate, Iron, Niacin, Thiamin), Margarine, Water, Caster Sugar, White Sugar, Thickener (Modified Maize Starch), Invert Sugar Syrup, Sugar, Butter (Milk), Raising Agents (Sodium Bicarbonate, Disodium Diphosphate), Salt.